Sump Pump by Kevin Ginnings Plumbing Service Inc.
Did you know that sump pumps generally last only 5 to 7 years? If your sump pump is old, call Kevin Ginnings Plumbing Service Inc. to install a new one. When plumbers install your sump pump, you have no way of knowing that they did a good job until it rains. This is because your sump pump will lie dormant until flooding forces it into action. Unfortunately, you just have to find out the hard way. Instead of going with an untested plumber, why not choose Kevin Ginnings Plumbing Service Inc.? 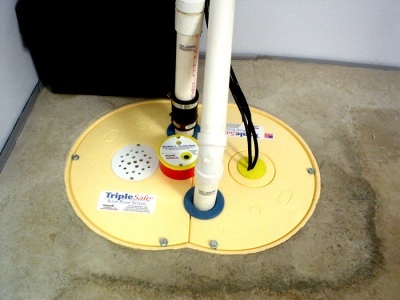 We’ve been in business since 1985, and we have an excellent record of sump pump installation and repair. If your sump pump fails, it’s crucial to get all the water out of your basement as soon as possible. Standing water can create a perfect environment for mold and other harmful organisms. This is why we offer emergency sump pump repair. It’s also a good idea to call Kevin Ginnings Plumbing Service Inc. to service your sump pump in the event of news of a flood. We can do a quick tune-up to ensure that your home is ready for mother nature’s worst. We do everything we can to ensure that your sump pump is up to snuff for the next big storm. Your sump pump runs on electricity, and guess what? If a storm knocks out your power, it knocks out your sump pump. Ask Kevin Ginnings Plumbing Service Inc. about emergency batteries to keep your basement dry even when the power goes out. By offering installation, repair and maintenance, we ensure that no storm is a match for your sump pump. Call Kevin Ginnings Plumbing Service Inc. at (816) 832-4322 now for a free quote!